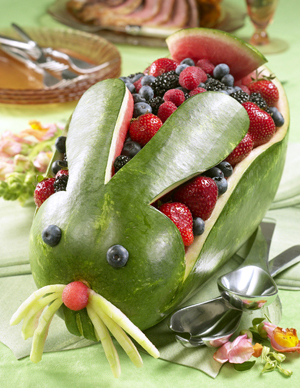 Watermelon carving is so much fun especially when you can carve Rabbit! Simply follow the instructions and gather the necessary materials and lets get started carving watermelons! 1. Using an oblong watermelon, cut a ¼ inch slice off the bottom to provide a stable base. 2. Draw lines with a sharp pencil or thin marker to draw ears and upper body on the top side of watermelon. 3. Cut along the lines and remove excess rind. Place to the side to use later for the whiskers and tail. 4. Hollow out the watermelon, being careful around the ears. 5. Carve six whiskers out of the excess rind with a small knife and trim off outer dark green rind so lighter green interior is showing. 6. With a melon baller cut out the eyes and nose and place the melonballs or blueberries in the holes. Use toothpicks to secure. 7. For the teeth, make a rectangular cut below the nose leaving the top part of the rectangle attached to the watermelon. Cut a small line down the middle to make two teeth. 8. With round toothpicks attach whiskers below the nose.